Mexico City. The fish catch decline with the increase in the destruction of mangroves estimated annual loss of about 800 pounds of shrimp and commercial fish per hectare of these ecosystems destroyed, because the correlation between the extent of the tidal zone (mangrove the tropics) and the amount of catch in the waters adjacent said Francisco Javier Flores Verdugo, specialist in biological oceanography and fisheries. These areas are of great importance not only for its socio-economic value, but by the ability to maintain high productivity and balance in the lagoon estuarine environments. Fertilities presented as high as the most efficient domestic crops, in some areas reach capacity to export that adjacent marine waters and in arid regions adjacent terrestrial ecosystems are functionally equivalent to an oasis, added the researcher of the Institute of Marine Sciences and Limnology (ICMyL), Unit Mazatlan, UNAM. Three quarters of the Earth's surface is covered by water, but 90 percent have fertility similar to that of a desert scrub. Sea fertile regions cover only 10 percent and are located within coastal ecosystems, particularly mangroves. In fact, he added Flores Verdugo, an estimated total world fisheries, 90 percent is done in coastal regions, and of those, 70 percent are at estuarine organisms, or those who at one period of his life living in these environments. The benefits of mangrove-estuarine and lagoon ecosystems comprise a variety of goods, services, uses and functions of value to society, flora and fauna, as well as for the maintenance of natural processes, and interact with other marine and terrestrial . For example, there is evidence that destruction causes loss of coral reef structure, detailed the university. Mangroves are characterized by high production are habitat to support fisheries of the continental shelf, are areas of food, shelter and crustaceans and fry growth and protection of flora and fauna, including species threatened with extinction , endemic and migratory. Systems also act as natural flood control and erosion, as hurricane protection and saline intrusion, and improve water quality by acting as a biological filter. An estimated 60 to 75 percent of the tropical coasts are bordered by mangroves. The extension covering the country is six thousand 600 square kilometers, and ranks sixth in the world. Have adaptations to soils rich in organic matter (anoxic) and comprise more than 50 species, of which four are widely distributed in Mexico red mangrove (Rhizophora mangle), black mangrove (Avicennia germinans), white mangrove (Laguncularia racemosa) and buttonwood (Conocarpus erectus). In the country are referred to within the standard 059 of the General Law of Ecological Balance for conservation, with a special category for mangrove protection white, black and buttonwood, and a rare species, the red mangrove. They are also under a conservation or sustainable use by various standards such as NOM 022 for the conservation of wetlands, he said. I as a MAP-Thailand’s Field Project Manager was selected to attend a three days event called the “Livelihood Network Camp 2012 (2nd Edition) 8-10th October 2012: “learning by doing” at Araku, Vishakapatnam, Andhra Pradesh, India. There were 140 participants which came from from 21 countries and 65 organizations, including private companies and NGOs. I was the only participant from Thailand. 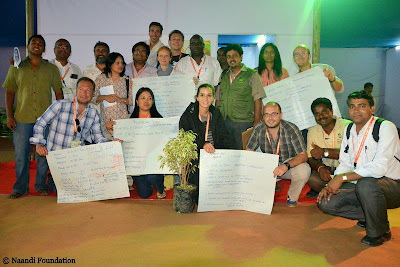 The objective of the Livelihood Network Camp was to share experience and knowledge and explore innovative solutions and know-how in order to support efficiency and sustainability for the implementing projects in the Araku valley of Naandi Foundation and in other parts of the world. Photo 1 Ning in the middle of the Livelihood Camp participants. The camp was help in the Araku valley, where the tribal people are now growing fair-trade organic coffee supported by Naandi Foundation, a local Indian NGO which is playing an important role helping the farmers with training in sustainable agricultural practices, setting up a state-of-art coffee processing unit and formation of a Small and Marginal Tribal Farmers Mutually Aided Co-operative Society (SAMTFMACS) with a connection to the international market. There were 6 sub-workshops during the camp. differentiation for the communities involved. Our task was to provide recommendations to Naandi Foundation on how they could adjust from a pilot action to large-scale implementation. The project being implemented at Araku is one of the projects supported by Livelihoods, an organization based in Paris supported by donors in France as well as a well as the worldwide dairy product company, Danone . 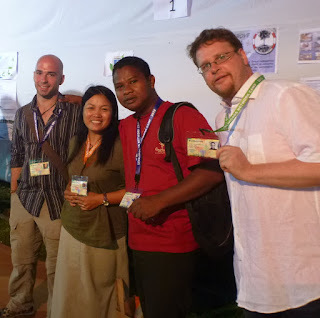 There are 3 programs including Livelihoods Fund, Livelihoods Venture and Livelihoods Network. Under the Livelihood Fund programme there are three mangrove restoration projects funded in different regions of the world. They are being implemented by Nature Environment & Wildlife Society (NEWS) in the Sunderbans-India, Casamance in Senegal and Yagasu in Indonesia. I had the opportunity to present a poster on MAP’s work and shared the Ecological Mangrove Restoration (EMR) approach with the other NGOs representatives who are working on mangrove restoration mentioned above. Photo 3: Ning’s poster presentation session regarding MAP’s Ecological Mangrove Restoration (EMR) and Livelihoods activities in Thailand.